Re: How to find gold in your Lazy-Boy chair before you ever leave home. If you prospect 100 miles from where the gold is or 100 feet for that matter your only discovery will be FRUSTRATION. Did you know that the US Government will TELL you the exact location of every gold find on EARTH for free… if you know where to look? Have you ever wondered why some prospectors always come home with nuggets in their pockets while others just have skinned knees and sore backs to show for a weekend of panning? Are you stuck because you simply don't know WHERE to prospect? That's OK. This is what I do, I can help you. You could go out and read EVERY book ever written on prospecting spend HOURS interviewing industry insiders, and actually go out in the field and DO this stuff like I have. Watch this simple DVD that condenses down everything I've learned about locating bonanza sites into a 41 minute video. No fluff and NO B.S. Just the raw information and systems you need to make your own gold maps so you can find gold your very next trip. How this simple, easy to use software (available for free from Google) allows you to export and save these proven gold locations to your own computer with exact coordinates with only 15 minutes of work. Why water and topology are crucial to determining successful gold prospecting locations, and how to use them so you quickly pick out the right spots with out any extra effort. Where to look to determine the quality of gold that was mined from any location so you know what kind of mining gear you will need. How to use this system to find gold locations even outside the U.S.A. so you can find gold regardless of where you live! How to take all your data and translate it into useful, practical information so you can pinpoint the exact area you will be mining. Don’t let the size (Just 41 minutes) fool you. Over 100 hours of research and field work went into this project. It is truly the best of the best there is, and the system is simple and FAST to learn so you can implement this information immediately. There is an old saying in business “Pioneers get scalped but settlers prosper” Think about it, before you go out and try this on your own. Can you imagine how much faster and easier it is when you follow a proven system of dozens of “Pioneers” before you that made 1000 costly mistakes before being successful at locating gold pay-streaks. Having access to every gold mining location recorded and documented by the United States Government! “Once again thanks for all the help and videos Jess..."
I always find more gold after paying close attention and applying what I've learned. This is my second season and I've collected about a 1/4 ounce in about 18 hrs. worth of work. From knowing nothing to seeing beautiful color in my pan...mind you I'm using no more than a keene sluice and a blue pan..and the results are amazing..."
“Great video series ... thanks for putting it together. I hadn't known about the Helical effect before ... learned something new." Very happy with what I saw! Thank you very much. It's like Christmas..."
Jess is so right on when it comes to sun screen or oil of any kind in the pan or on your hands. You won't believe how the small gold floats. 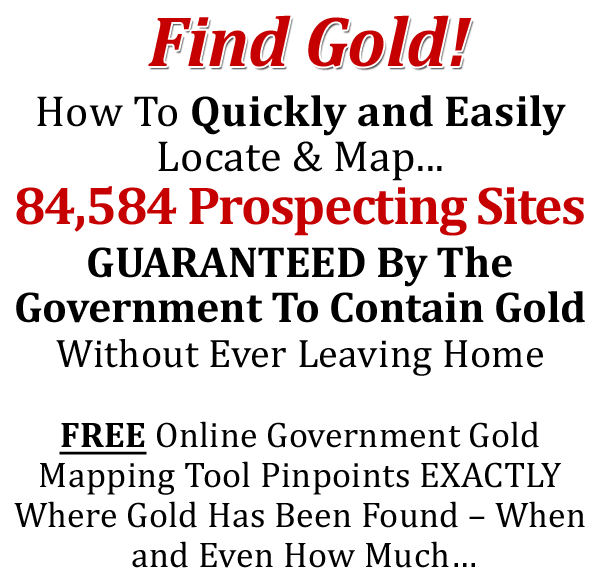 I've been really impressed with Prospector Jess and his videos and have learned a great deal from him." "I really liked the videos outlining how to track a pay streak in the river curves. I am about one year into prospecting and this revelation really tweaked it in for me." I'm only charging $49 for this DVD Video, and not giving this DVD Video away, for 3 reasons. $49 puts the DVD Video within reach of the vast majority of people. It's not too expensive for even the humblest beginning prospector. If Anyone who is not serious enough to put down the price of a dinner for 2 and buy this DVD Video on gold prospecting, I really can’t even understand. Anyone who is serious enough to put down the price of a fast food dinner and buy this DVD Video has the opportunity to discover a gold bonanza. If you're thinking, "$49 is so cheap! What's the catch? ", then you really need to get this Video! It explains how you can create accurate gold mining maps where gold is nearest to you, and why you need to seriously think about using your gold maps to find gold today! So if you're serious about joining the gold rush in 2016, and if you would like to start TODAY click the "Add to Cart" button below. If you need to justify the expense, skip going to McDonald's or Starbucks twice this week and it's paid for. Guarantee #1 If for any reason you think my DVD Video isn’t the best $49 you’ve ever spent just send me an email and I’ll gladly refund your whole $49 big cash dollars. Guarantee #2 If you actually DO what I recommend for you to do in the system and your results aren’t great, I’ll actually refund TWICE your money. All I ask is that you give me an honest effort. Get help before you try to create and read a gold map yourself or you could screw up big time and get STUCK in the WRONG PLACE without any Gold! …and when a full system is only $49 Bucks, you’d be pretty dumb not to grab it. Either give up on this entire idea, or get this DVD Video, otherwise your sure to make mistakes, in areas you haven’t even thought of yet. P.S. Remember, There is more real actionable information in this DVD Video than you’ll get reading a dozen books. The systems inside the DVD Video have worked for other people just like you, it’s 100% guaranteed so you can’t possibly lose money. It’s a no brainer.